Quesadillas are one of my favourite dishes. Not only is it quick and easy to cook, they are also one of the most freestyle-able dishes that I know of. It is not really rocket surgery to make quesadillas but it is hard to run out of ideas and combinations. You can make sweet as well as savoury ones. 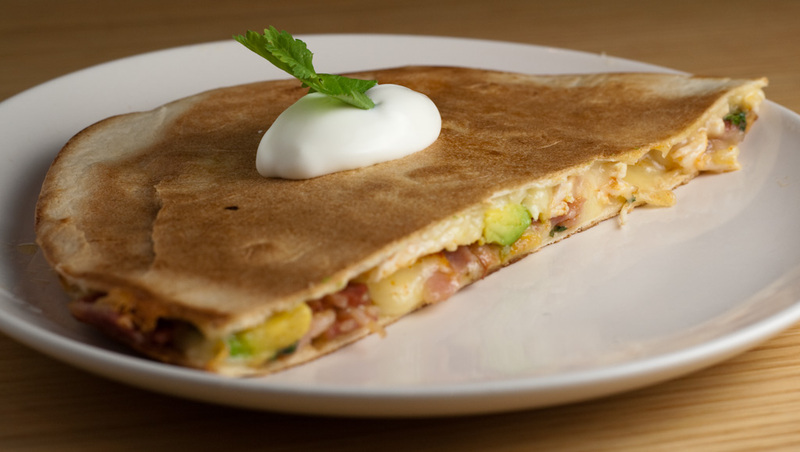 Quesadillas for dessert can be ace, if you just got the guts to try it. I'm using a poached chicken breast in this recipe, for instructions on how to best poach it - have a look here. You can eat quesadillas with your hands or with knife and fork if you need to behave in front of others. I sometimes make one extra, let it cool, cut it in four pieces, clingfilm each piece and then I got next days lunch for work sorted. This is just one of my many quesadilla variations, there might be more recipes with different variations coming your way soon, but in the meantime - just freestyle it and make them your way. I never use oil or butter in my pan when I cook quesadillas. Trust your well seasoned cast iron pan or a good non-stick pan instead. As always, the measurements here are mere indications. Use your own judgement and make them the way you want them. Top a tortilla with a good layer of grated cheese. On top of that - portion out chicken, avocado and bacon. If you are using any of the optional extras, add those too. Finish off with another layer of cheese. Put the tortilla into a frying pan on a medium-low to medium heat. Top with another tortilla, press down with a spatula and cover with a lid. Cook for about 3 minutes, flip the tortilla, cover again and let cook for another 3 minutes or so. Keep the cooked ones warm and repeat until all quesadillas are done. As promised, here's the follow up to the last post - using up the last of the tomato sauce I made. If you found this post from a search engine or similar, here is the original post. Also, I did choose to add the base recipe to this post too, just in case you did not read the last post first. 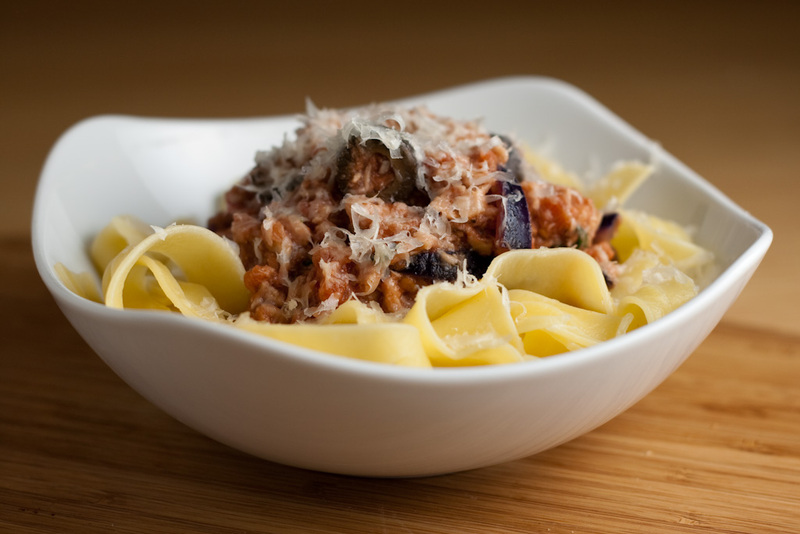 You can just use the sauce as it is, a vegetarian option, but you can also pad it out a bit by adding some tuna. Should you have some fresh basil lounging around, chuck that in too. This is a very simple recipe that you can use as a base and just freestyle it to suit you. Add and subtract ingredients as you feel like - make it yours. Heat some olive oil in a pan on a medium heat. Chuck in the onion, garlic and chili and let that sizzle for a couple of minutes until the onion starts to soften up. Pour in the tomatoes and stir in some olives. Add a splash or two of Worcestershire sauce, some sugar and season to taste. Let this simmer for a couple of minutes. If using, stir in the tuna and the basil leaves and let them heat through. Serve on pasta and if you're using it, grate some parmesan on top. This recipe is one I made up just to use some stuff that was in my cupboards, in the freezer and so on. There is always the odd vegetable around that is threatening to go really bad, there is that Unidentified Frozen Object in the freezer compartment and so on. Some days I just take stock of what I got and try to get something edible out of it. This time, this was the end result. Leftover mash is great to use in pies so there's half a dish decided already. 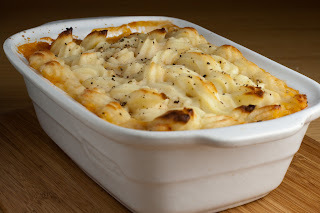 Finding a cod fillet in the freezer moved the decision towards some kind of fish pie. Add a tin of chopped tomatoes and you're almost there. Some rummaging around on my vegetable shelf and in the cupboards and it all came together. You might notice that I actually use quite a small amount of the tomato sauce in this recipe so you'll be glad, yes you in particular Pete ;), to know that the next post will use the remainder of the sauce for another recipe. No wastage here this time. Also, the cod in question is of the sustainably sourced sort. Start by making the tomato sauce. Heat some olive oil in a pan on a medium heat. Chuck in the onion, garlic and chili and let that sizzle for a couple of minutes until the onion starts to soften up. Pour in the tomatoes and stir in some olives. Add a splash or two of Worcestershire sauce, some sugar and season to taste. Let this simmer for a couple of minutes. Put to the side. Put a layer of potato mash on the bottom of a deep-ish ovensafe dish that is big enough to hold the cod fillet in a single layer. Pop the cod fillet on top of the mash. Spoon on some tomato sauce on top of the cod, enough to cover it. Finish it all off by covering it all, pipe it if you are a bit faffy like me, with some more potato mash. Pop it into the oven for about 20 - 25 minutes or until piping hot and the mash starting to get some colour. This soup is fairly quick to make and I find it quite filling. It is versatile too. You can either serve big portions of it as a winter filler meal or you can go for a daintier approach and serve it as a starter. I can't really think of more to say, it is such an easy and straightforward soup to make so I think I'll just head over to the recipe. Melt 2 tablespoons of the butter in a pot on a medium heat. Once it starts bubbling add the shallot and let it fry for about a minute. Add in the white wine and the garlic and continue frying for a couple of minutes. Add the potatoes, chicken stock and water. Bring this to a boil, once boiling reduce to a simmer. Let this simmer for about 15 minutes or until a knife easily pierces the potatoes. Drain the pot through a sieve into a bowl. Remove all the solids from the sieve apart from the potatoes. Put the milk, double cream and 375ml of the cooking liquid back into the pot. Put this on a medium heat and using a potato ricer press the potoato into the pot. Give it a couple of gentle stirs once all potatoes are riced. Whisk in the remaining tablespoon of butter. Season well with salt, pepper and cayenne. 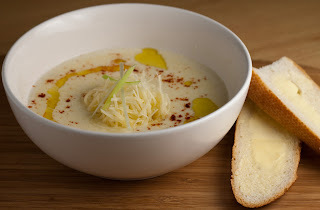 Put some grated Gruyère into each soup bowl, pour in soup. Garnish with some olive oil, a dusting of smoked paprika and some spring onion slices. Yet again a recipe which is fairly quick to cook. The only thing that takes a little time is marinading the pork and slaw. If you prepare the marinade the night before you can have this sandwich in a very short time after getting home. I'm not really sure what to class this as, the usage of the soy sauce, garlic and ginger for the pork does give it a slight oriental taste to me. Well, it's a simple recipe so I shouldn't waffle about it for too long. As I some times do with recipes of this kind, there are no measurements, freestyle it to suit you and your taste. Stir in all the ingredients in a non-reactive bowl and mix well. Cover with cling film and put in the fridge for at least a couple of hours, preferably over night. Mix all the ingredients for the marinade in a plastic bag, add the pork tenderloin and make sure to coat it well with the marinade. Put this in the fridge too, for about the same time as the slaw. When it comes to cooking it - drain the pork, pat it dry with some kitchen towel, slice it fairly thinly. Fry the slices in a frying pan with the olive oil on a medium heat. Remove from the pan and let it drain on some kitchen towel. Remove the coleslaw from the fridge and let it drain in a sieve. Slice the bread in half, drizzle the cut sides with olive oil and quickly brown them under the grill. 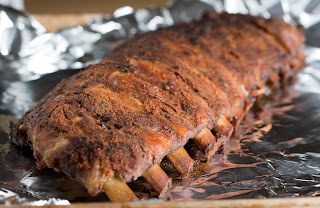 Once browned, remove from under the grill and spread both halves with mayonnaise. 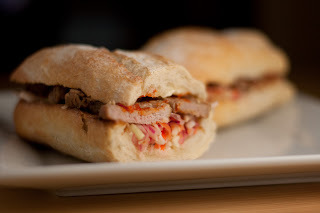 Add the coleslaw on the bottom half, top with the pork and drizzle with some Sriracha if you are in that mood and then close the sandwich up with the top half. I have always been a big fan of various fish and shellfish cakes but this was actually the first time I tried my hand at making prawn cakes. Normally when I make fish cakes I would use mashed potatoes as a base/binder but for these prawn cakes I used egg and breadcrumbs to make it all bind together. If anyone thinks that the red on the egg noodles might be ketchup, please think again. It is sriracha chili sauce, there to give some more oomph. If that is a bit too spicy for your taste, why not try some sweet chili sauce with them? 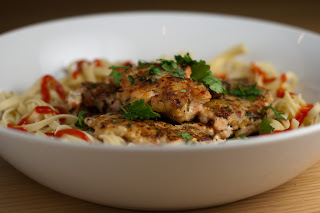 The same goes for the egg noodles, the prawn cakes would go excellent with a nice and crispy salad. I actually think that the sweet chili sauce would be better with the salad option than sriracha would be. Ok, let's see how I made these little tasty bites. In a bowl mix the prawns, onion, coriander, lime juice, lime rind, fish sauce and chili flakes. Stir in the egg. Cover and leave to chill in the fridge for about 30 minutes. Remove and stir in the bread crumbs. Heat some oil in a frying pan on a medium heat. Wet your hands with water and roll balls of the prawn mix about the size of golf balls. Slightly flatten them and cook them in batches in the frying pan. Let them fry for 2 - 3 minutes on each side, letting them get golden and cooked through. If your pan is too small to cook them all at the same time, make sure to keep the first batch(es) warm while you fry the rest. Serve with your choice of side and sauces. 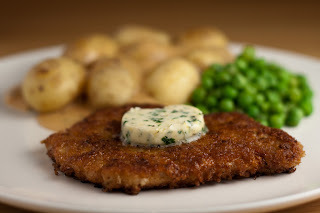 Schnitzels have always been a big favourite of mine, I just don't cook them often enough. To remedy that I made myself some schnitzely goodness the other night. If you got the base recipe you can make schnitzels out of quite a lot of different meats and cuts. I've always, probably incorrectly, seen schnitztels as something from Austria/Germany but I know there are quite a lot of local variations of this around the world. The Americans got their Chicken Fried Steak, there's the Chicken Milanese from Italy and so on. This recipe is fairly basic but you can freestyle it to your hearts content, why not add some grated parmesan to the breadcrumbs to create a bit more of a adventourous flavour? Traditionally, at least in my tradition, you get lemon wedges to squeeze over your schnitzels. I decided to do something a little bit different from that - a lemony spice butter. Spice butters is a good way of using up leftover herbs and they can be freestyled like crazy. I'm sure there's a limit as to how long you can keep them in the freezer but mine rarely last very long in the freezer. To follow my own trend I'm not giving any exact measurements for the spice butter, use your own preferences and freestyle it until you like the flavour. For the spice butter, just stir all the ingredients together in a small bowl and test the proportions/seasoning until you're happy. Either chill in the bowl or put the butter on some cling film and roll into a log that you either chill or put in a freezer. Mix the salt and pepper with the flour on one plate, put the beaten egg on another and finally the breadcrumbs on a third. Beat the loin steaks with a mallet (or some other suitable implement) until they are evenly thick, about 3 - 5 mm. Create the coating by doing the following for each one of the loin steaks: Dredge them in the butter, dip them in the eggs and then finally into the breadcrumbs. Push them into the breadcrumbs quite hard to make sure to get them to stick. You can now let them sit on a plate in the fridge for a little while to 'firm up' a bit. Heat the butter in a pan on medium heat and fry the schnitzels for 2 - 3 minutes on each side or until cooked. Serve with new potatoes, peas and a creamy mushroom sauce. Yes I know, this recipe has got a bit of a corny name. 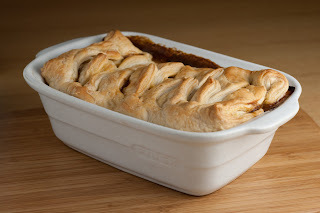 The reason for that is that I was asked if I could come up with a recipe for Lurpak during the National Pie Week so I thought I'd come up with a bit different name to stand out. The name comes from one of the uses I can think of for these pies. Make the filling the day before, start watching the game, prepare the pies in half time and then you can eat them straight after the match is over. What I aimed for was a pie with a very thick and comforting filling. Cooking it this low and slow really made that happen. It might seem like a big effort for just some pies, but trust me - take the time and you'll find that it was well worth it. It is big words but I think I got close to the quality of the meat pies I tasted down under. Mix the flour, salt, pepper, paprika and ground cumin in a large bowl. Toss in the stewing steak, make sure to cover all pieces with flour, shaking off any excess. Heat a knob of butter and some vegetable in a large oven safe casserole dish with lid. Fry the steak in batches until they start to brown. Move the fried pieces to a plate while you finish frying off all the steak. Once all the steak is fried you can return the reserved steaks. Add in the onions, mushrooms, bay leaves, garlic and thyme. Stir in the beef stock, beer, a good splash or three of Worcestershire sauce and the tomato puree. Give it all a couple of good stirs before putting the lid on it and shoving it into the oven. Increase the oven temperature to 180c. Grease the ramekins with butter and push in the puff pastry. Fill with pie mixture and fold over the remaining pastry. Cook in the oven for about 20 - 25 minutes or until the pastry is nice and golden and the filling is hot.